spectrum pulse: album review: '4eva is a mighty long time' by big k.r.i.t. 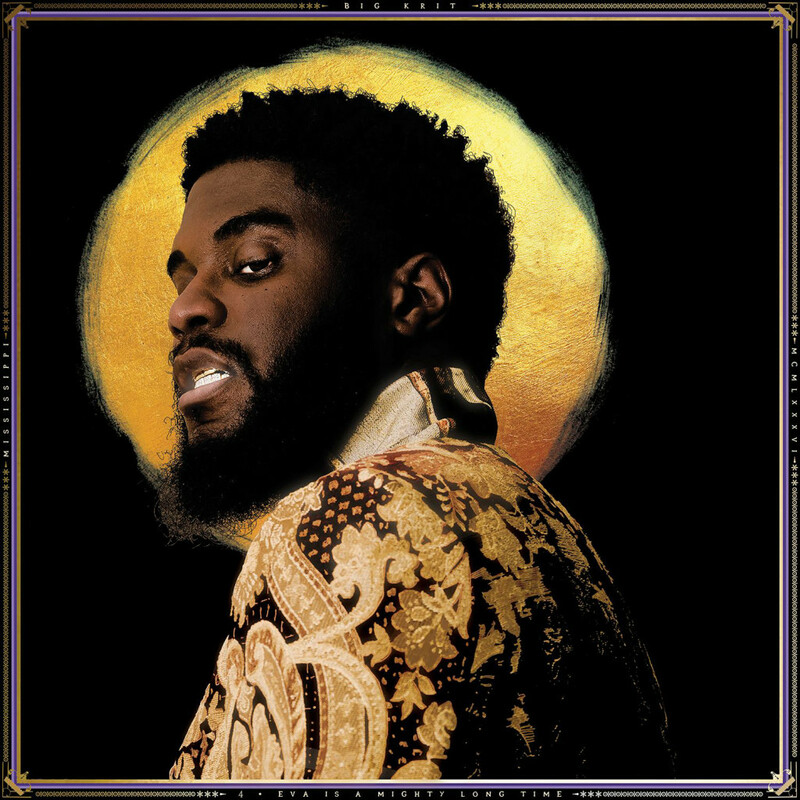 album review: '4eva is a mighty long time' by big k.r.i.t. I've always been of the opinion that Big K.R.I.T. should be so much bigger than he is. And that didn't happen. In fact, if I were to look at utterly tragic missteps in hip-hop management, it would be that Big K.R.I.T. never took off in the mid 2010s the way he should - and yes, you could make the argument that those major label projects were not as good as the mixtapes - in that they were decent to really good but never quite great - but I've covered entirely too much mediocre music that's impacted the Hot 100, whoever was promoting or managing him screwed this up big time. So it was no surprise when Big K.R.I.T. and Def Jam parted ways in 2016, keeping the mixtapes steady as he prepared a double album of material for independent release. Now to some extent I was a little concerned about this - to me double albums are always a risky proposition, especially if it becomes clear it could have been cut down. And the truth is that between the albums and mixtapes Big K.R.I.T. has put out a lot of solid material that has nevertheless done plenty to fill and nearly saturate his lane, and there was a part of me that felt for this to really stand out and resonate it had to be a home run for him, a swing for the fences, really elevate his sound to his best. So did we get it? And like always, the key words with Big K.R.I.T. are tied to versatility: this is a rapper who can play in moody, introspective territory while bringing massive bangers indebted to southern hip-hop, and it never feels inconsistent with who he is as an MC – mostly because he’s only growing more expressive and layered as a performer. As a rapper I’ve always liked this guy: an aggressive rasp that backs bars that are flush with the detail to never feel interchangeable, along with charismatic and diverse flows that show he’s plenty capable of riding damn near anything and doing it better – but what really impressed me was the expansion of his emotive delivery. I don’t think he’s an exceptional singer – although a song like ‘Keep the devil Off’ he’s pretty damn credible - but he is naturally expressive and even songs that require him to play in tougher territory like ‘Drinking Sessions’ are delivered exceptionally well – hell, as much as it feels reminiscent of Kendrick’s ‘u’, I think I might actually like this better! Hell, I’d certainly take him over that lisping mess that Lloyd delivers on ‘1999’, which is easily the worst track on the entire double album. Granted, it helps that the tones and guest singers – aside from Lloyd - he’s drawing on are more than capable of supporting him, from Cee-Lo Green dropping an uncharacteristic but decent rap verse on the flat-out excellent ‘Get Up 2 Come Down’ opposite some great melodic touches with the trumpet, all the way to Bilal, Jill Scott, and especially Joi belting their tracks on the second disc against some of the lushest soul instrumentals I’ve heard all year, most of which Big K.R.I.T. produced himself. And this ties into the second reason why I’d argue Def Jam was utterly crazy to not give this guy full creative freedom, because not only does this record sound expensive and clean in a way that belies his more braggadocious songs, but it’s nearly always anchored in real melody to back up his hooks, be it coming from liquid guitars, horns, or a lush watery sample that you can tell could easily be traced to the greats of southern hip-hop – I might not be wild about the hook on ‘Ride Wit Me’, but if there’s a guy who can sample the late Pimp C and call up Bun B to sound completely convincing, it’s Big K.R.I.T.. He gets T.I. on ‘Big Bank’ and it’s a natural pairing on a banger, but I think I might be more impressed by the slick cascades behind the gorgeous ‘Aux Cord’, or the oily, organ-infused funk of ‘Keep the devil Off’ or the choppy tone behind ‘Mixed Messages’ against a trap drum line that is far more complex than your average radio banger. Granted, the second disc of this project is aiming for more ambitious material, drawing on gospel and showing a greater breadth of instrumentation like the guitars and pianos on ‘Miss Georgia Fornia’ to the melancholic blend of piano and horns on ‘Drinking Sessions’ to the stunningly rich take on jazz that fills ‘The Light’… but I’m not going to lie, for his fourth track in the sub series ‘Subenstein’ might be one of my favourites just for the melodic interplay in the tuba with the distant keys, guitars, scratching, electric crackling, and a trunk-knocking beat that even sustains a remarkable beat switch. And it’s that diversity that helps so many of these tracks actually stand out – for a twenty-two song double album, even if I will say the record can drag a bit at the end of each disc, it goes down remarkably easy.